Commissioner of Police, Seelall Persaud (left) and Assistant Commissioner of Police, David Ramnarine. while the latter was leading the force, has finally been settled. The ranks who were promoted by Ramnarine will remain in their respective positions. 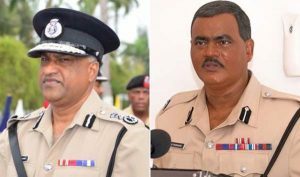 At the Minister of State Joseph Harmon’s weekly post-Cabinet press briefing held yesterday, it was disclosed that the Minister of Public Security, Khemraj Ramjattan, had indicated to Cabinet that all of the police promotions approved by Ramnarine will stand. Kaieteur News was told that Persaud has been informed of the government’s position regarding this issue. The decision to let the promotions stand was supported by legal advice. When Commissioner Persaud returned from 100 days’ leave early this month, he reversed all the promotions which were approved and granted to ranks across the country by Ramnarine. Reports are that between August 15 and October 1st, Ramnarine promoted Corporal Wilburg to Sergeant; and Lance Corporal Fraser; Lance Corporal Kumar, and Lance Constable Craig to Corporal. Additionally, between August 3rd and September 26, 2016, he promoted Constables Gay, Semple, Kesney, and Thomas to Lance Corporal. The Top Cop proceeded on leave in June and when he returned, he reversed Ramnarine’s promotions with immediate effect. In his letter to Staff Officer Administration 1 Maxine Graham, Persaud called for the rescission of the promotions Ramnarine had made. He drew the officer’s attention to Article 212 (3) of the Constitution of Guyana, noting that the Commissioner of Police is authorized to make appointments to any office in the Police Force below the rank of inspector. He also quoted Article 211 (i) of the said constitution, which he said indicates that the appointment of the Commissioner of Police is done by His Excellency the President. ”His Excellency the President makes such appointments by issuing an instrument which is signed by him/her”, he said. ”The Police chief, Assistant Commissioner Ramnarine, has misinformed himself that he has the authority to make any such appointment in the absence of an instrument issued by His Excellency the President. The appointments are therefore null and void, and the ranks should be so informed,” Persaud ordered.